In the 1950’s, my best friend, Robert, introduced me to astronomy. I introduced him to stamp collecting. I definitely got the better of the deal- the stamp collecting is now a thing of the past for me, but a love of astronomy just grows and grows. Rob had a little terrestrial (not astronomical) telescope, with a comparatively tiny front lens of around 70mm. It had a simple mount (altazimuth-type for the aficionados), and because of the swiveling nature of the mount, was quite naturally named ‘Elvis’. While Elvis was pretty basic as telescopes go, with a little study, and a lot less light pollution than we suffer today, he was our tiny window on an “amazing and expanding universe”. (Yes, we both love Monty Python’s Galaxy Song). Now, I’m a young 67, born in 1944. I’ve been fortunate to live through some amazing times, and some wondrous discoveries. Only 21 years before I was born, Edwin Hubble detected a variable star in the Andromeda galaxy, that led us to understand that our Milky Way Galaxy is only one of billions of ‘island universes’. 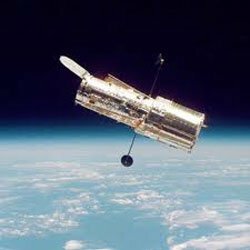 Only 16 years before I was born, Hubble’s work on researching the redshift of these ‘island universes’ led to the realisation that the universe is expanding. When I was 5, Fred Hoyle coined the term “Big Bang” to describe the theory that has become our best understanding of how the universe was born. When I was 9, the double-helix structure of DNA was discovered. When I was 12 years old, Sputnik became the first artificial satellite. When I was 24, Neil Armstrong became the first human to walk on the Moon. It wasn’t until my mid-20’s that our understanding of plate tectonics became widely accepted. It wasn’t until I was in my mid-30’s that Luis Alvarez and others discovered evidence of the Chicxulub impact that likely led to the end of the dinosaurs. How the Hubble Space Telescope’s Ultra Deep Field photo became a 3-D video. The advance of scientific knowledge during my lifetime has been mind-boggling. Not the least, has been the advance in our knowledge of cosmology- how the universe works. When I was 59, astronomers at the Space Telescope Science Institute (STScI) unveiled the deepest portrait of the visible universe ever achieved by humankind, called the Hubble Ultra Deep Field (HUDF). Over 400 orbits, 800 exposures were taken by Hubble Space Telescope’s camera of a tiny piece of sky, one fiftieth the size of the full moon. The total exposure time was over 11 DAYS. What the photo revealed was simply awesome. In that tiny slice of sky, there were THOUSANDS and THOUSANDS of galaxies. What they did next, was to create a 3-D ‘flight’ through the Hubble Ultra Deep Field, dramatically presenting this most distant visible-light view of the universe. The redshifts of 5,333 galaxies were converted to distances, to assemble the 3-D model of the data. As you ‘fly’ this beautiful, awesome, humbling visualization, remember that the light from the furthest galaxies has taken 13 BILLION years to reach us. Without further ado, here’s the video. In an area of sky just one-fiftieth the size of the full moon, we can find over 5,000 galaxies. How many is that in total? Maybe 100 Billion galaxies. The average galaxy contains some 100 Billion stars.